Simple installment: Available on Cloud () and Self-Hosting () Pricing Basis. Want your Exams and Records running within a month? 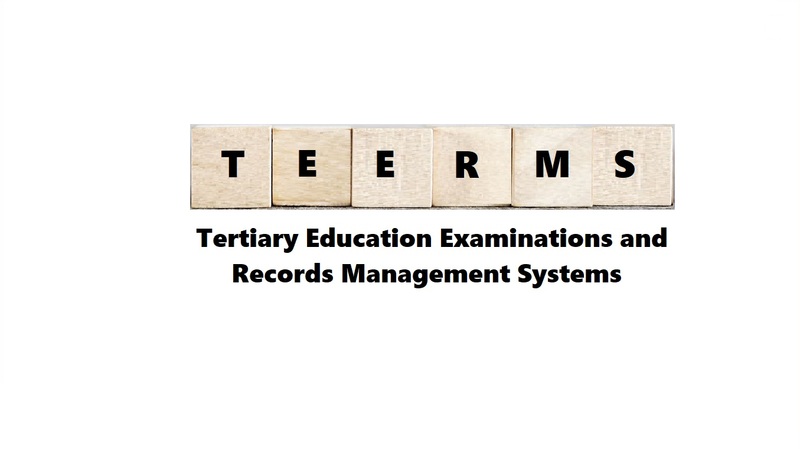 Why Run Your Exams and Records With TEERMS? 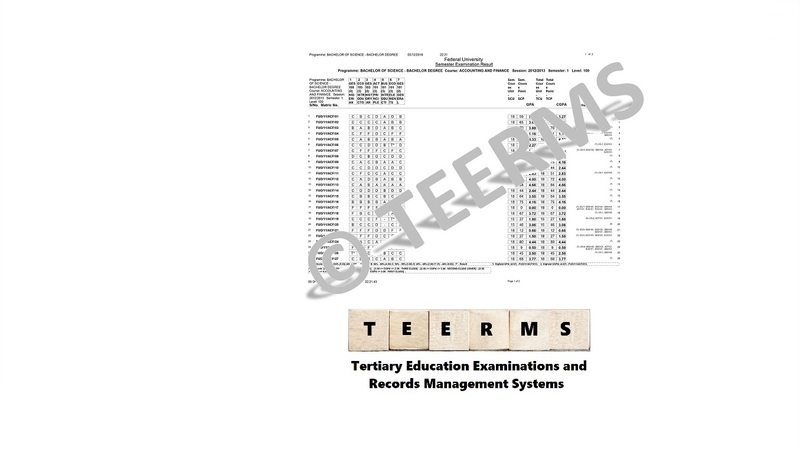 Tertiary Education Examinations and Records Management Systems (TEERMS) is a software and solutions designed to help institutions automate the process of generating students' examination results. TEERMS is designed to efficiently process scores, store results, automatically calculate grades and classify points, interpret students’ overall results, generate results summary and create digital academic achievement report for each student. As students' population grow the usual manual and end-user computing (e.g. MS Excel) processes start to become herculean task to process and produce students result in a timely manner. 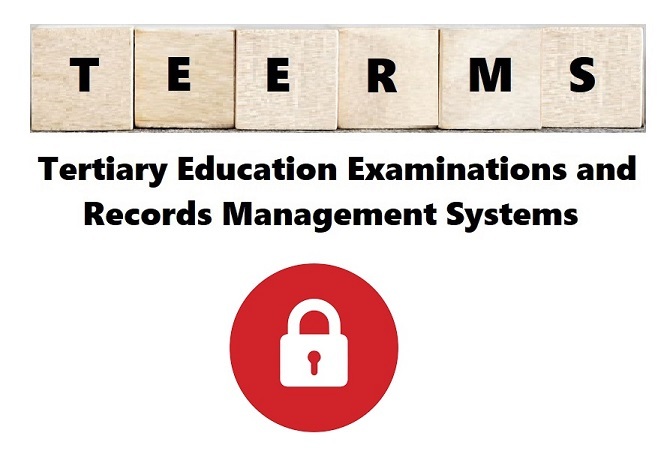 TEERMS is a complete automation of the examination and records processes. It saves your institution money, it is cheaper and afford you opportunity to world-class IT professional services. If you currently have a robust manual and end-user computing examination and record processes, the integrity, security and confidentiality of your students’ results cannot be guaranteed. However, TEERMS students’ results records are individually digitally signed and encrypted. This high-level encryption process is verified and validated each time any student record is requested. This ensures that the results that is approved by your institution is what you have at all times. TEERMS software combined with your institution’s examination and records process control is what your institution needs for efficient generation of students’ results. DigitalTranscript will be available on www.TEERMS.com after been validated and verified by the issuing institution and maximise the value of verified academic credentials. TEERMS, provides access to student records as they develop throughout thier studies, which allow students to share them securely with any employer, university or other third party as a verified record of their tertiary academic achievements. TEERMS will help you to get results to your students in lightning speed. 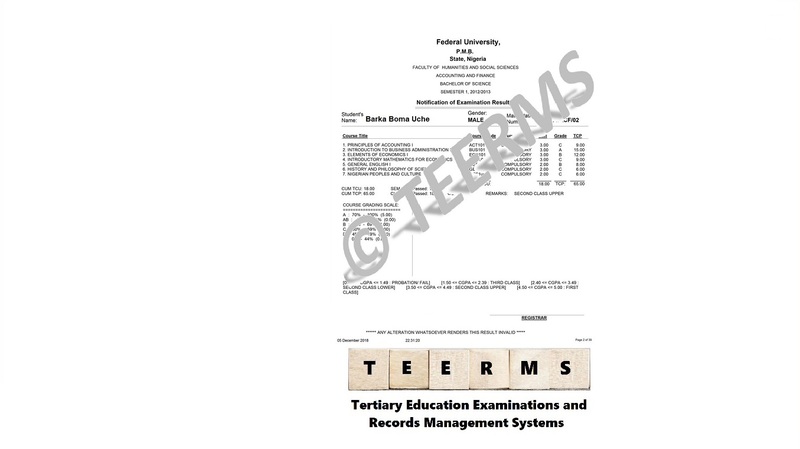 TEERMS is a Digitally Secure and Verified Academic Records Systems. 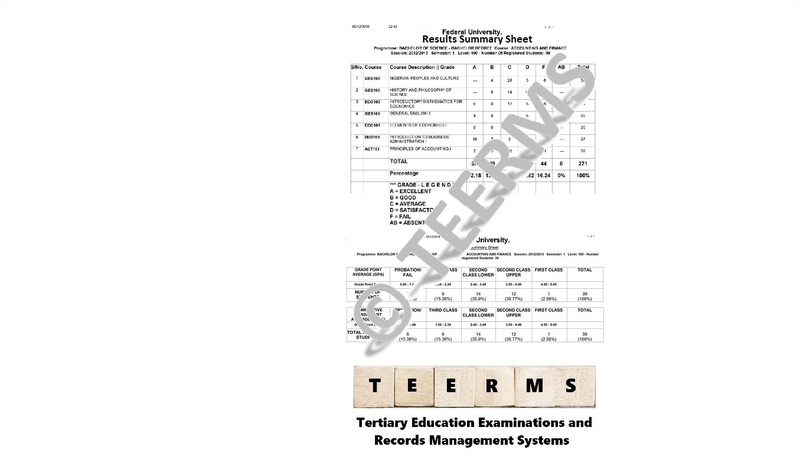 TEERMS is what your need to achieve 100% and quick examinations record processing in record time. You should buy TEERMS because it will significanlty boost your students' academic performance. Prized Consulting is an established, market-leading provider of software, producing Enterprise Resource Planning (ERP) systems to the education sector. At the heart of TEERMS software is the DigitalTranscript, a tertiary education report. DigitalTranscript has the potential to transform the journey from higher education into work or further study and support improved university-business relationships. DigitalTranscript provides a description of the nature, level, context and status of the studies (degrees, certificates, diplomas etc) that were pursued and successfully completed by the individual named on the original qualifications to which this DigitalTranscript is appended. DigitalTranscript will be available on www.TEERMS.com after been validated and verified by the issuing institution and maximise the value of verified academic credentials. What's the difference between Cloud and Self-Hosted options? With TEERMS Cloud, we host and setup your TEERMS Software site in the cloud for you. This is generally the best option for institutions who want to get started quickly and easily, and for institutions who don't want to manage the technical complexity of hosting themselves. No servers, no storage, no maintenance — we run it for you. With TEERMS Self-Hosted, you host TEERMS Software on your own hardware and network and you're able to customize your setup however you'd like. This is generally the best option for institutions who want to manage all the details of the setup and don't mind the additional complexity of hosting themselves. We believe the TEERMS Software licensing scheme is simple, upfront and equitable. Licences entitle you to use on an annual term license that includes updates and support. Licenses expire and are not perpetual. What is a TEERMS Software student? 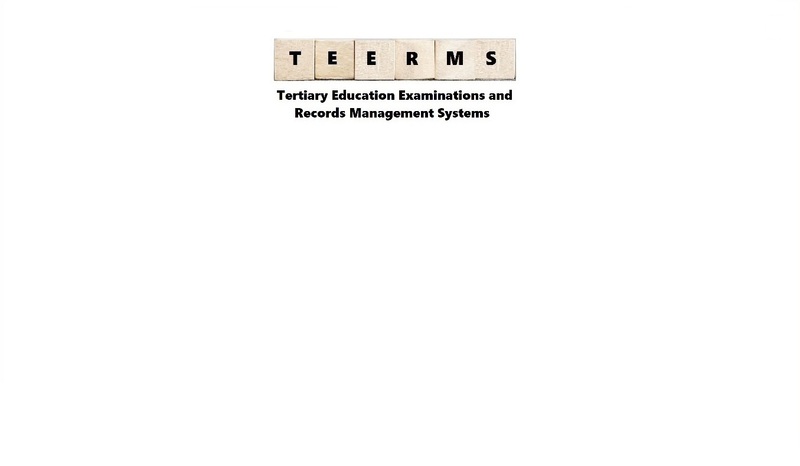 A TEERMS Software student is any active student account that any of the features and functionality that we've built into TEERMS Software have specifically been used for examination records processing. This includes, but is not limited to: Results Notification; Academic Reports; Senate Results and Exam/Sitting Arrangement. All licenses and payments can be paid via Bank Transfer or Cheque. Choose a pricing plan that fits your needs. *** This cost is based on 5,000 student records and course data submitted in standard electronic format (e.g. EXCEL, SQL or MS Access). Call for quote if your data is in paper or non-standard electronic format. With TEERMS Cloud Pro, we host and setup your TEERMS Software site in the cloud for you. This is generally the best option for institutions who want to get started quickly and easily, and for institutions who don't want to manage the technical complexity of hosting themselves. No servers, no storage, no maintenance; we run it for you. With TEERMS Cloud Premium, we host and setup your TEERMS Software site in the cloud for you. This is generally the best option for institutions who want to get started quickly and easily, and for institutions who don't want to manage the technical complexity of hosting themselves. TEERMS Cloud Premium includes the added benefits of DigitalTranscript. *** This cost is based on student records and course data provided in standard electronic format (e.g. EXCEL, SQL or MS Access). Paper or non-standard electronic format will be billed separately. © 2018 TEERMS. Powered by Prized Consulting Inc.